Facts about Samoyed Dogs, "Scientific name for Samoyed Dog, or domestic canine, is Canis lupus familiaris". A Samoyed dog is a breed of dog that originated from the western side of Siberia and northwest of Russia. The name Samoyed originated from the Samoyedic tribe of Siberia. The Samoyed dog are mostly white in color and have long hairs. The Samoyed dog were originally used by the Siberia people to assist in herding reindeer and to pull sleds when they moved. The Samoyed dogs lived in the hide tents of the families and were also used to keep children warm in their bed at night. Female Samoyed Dogs are in heat for matting for about 20 days twice a year. Female Samoyed Dogs are pregnant for 60 days before they’re puppies are born. A Samoyed Dog is an omnivore, (definition-they eat both other animals and plants). All Dogs are direct descendants of wolves. Samoyed Dogs pant to keep cool with 10 to 35 breaths per minute with an average of 24 breaths per minute. A large dog breed resting heart beats between 60 to 100 times per minute, and a small dog breed’s heart beats on average between 100 to 140 pant a lot. The Samoyed dog are known to be gentle, intelligent, loyal and they enjoys spending time with their families. The Samoyed dog may run, bark or chase things due to their working heritage, otherwise these intelligent dogs may come up with an activity that will keep them entertained. The Samoyed dog have a compact and muscular size body, the head is wedge-shaped, broad and slightly crowned. 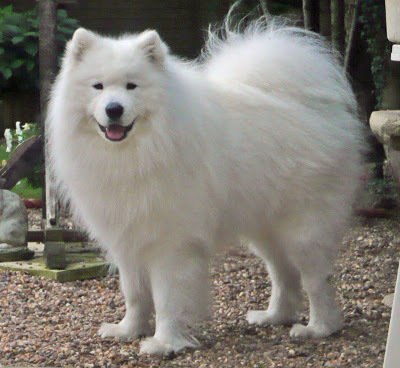 A Samoyed dog muzzle is in proportion to the size of the dog and is tapering to the nose. The color of the nose can either be brown or black. The eyes are black in color and are almond in shape and are wide apart with a slanting lower lid and dark rims. The Samoyed dog tail is well covered with hair and are moderately long. The undercoat is always short, thick and soft with long hairs growing out of the outer coat. The Samoyed dog coat colors are pure white, yellow and cream in color. In the show ring a pure white color is always preferred. Samoyed Dogs have two times the amount of ear muscles than people. It is a fact a Samoyed Dog can hear a sound at four times the distance of a human. Sound frequency is measured in Hertz (Hz) Def-Hertz is the measurement of frequency, explicitly it's one cycle per second. The higher the Hertz are, the higher the pitched the sound is. Samoyed Dogs hear best at 45,000 Hz to 65,000 Hz, while humans hear best at around 20 Hz to 20,000 Hz. Samoyed Dog’s nose prints can be used to identify them, their nose prints are like a humans finger print. It is a Fact a Samoyed Dog smells more than 1,000 times stronger than that of a human. A Samoyed Dog’s nose, secretes a thin layer of mucous that helps it absorb scent, after that they lick their noses and sample the scent through their mouth. The Samoyed dog average height from the shoulder is 19 to 23½ inches (48.2 to 59.6 cm) and the average height of the females is 19 to 21 inches (48.2 to 53.3 cm). The average weight of the male 45 to 65 pounds (20.4 to 29.4 kg) and the average weight of the female 35 to 50 pounds (15.8 to 22.6 kg). The Samoyed dog is a breed of dog that is friendly, easy going and devoted which makes it easy to get along with everyone. The Samoyed dog adapts easily to family life and gets along well with small children. Due to its intelligence it easily responds well to training if it is taught from an early age. When a Samoyed dog is given what is needed to have a stable mind it proves to be very social, outstanding and good mannered. A Samoyed dog loves peace and it never look for trouble but it knows how to defend themselves in case of danger. If properly trained a Samoyed dog is capable of getting along with other pets such as a family cat. Samoyed dogs need an extensive grooming since they are seasonally heavy shedding. Frequent brushing is needed to keep the coat clean even though the coat tends to remain white even without bathing it. A daily jog or walk is highly recommended to keep the Samoyed dog fit and healthy. The exercise should be taken easily especially during the warm season because the woolly undercoat prevents the loss of heat which is build up during the exercise. The Samoyed dogs are unsuitable to live in hot places because of their heavy coats. If it is frequently exercised a Samoyed dog can survive in an apartment since it is very active indoors and in a small yard. The number one heath problems amongst dogs is obesity, so always make sure your dog doesn't get to fat. Many foot problems that dogs have are just an issue of long toenails. Samoyeds can also suffer from hereditary diseases such as diabetes, Cancer, Subvalvular Aortic Stenosis, (PRA) Hypothyroidism, Samoyed Hereditary Ghlomerulopathy, Progressive Retinal Atrophy, allergies and Canine hip dysplasia. The diabetes occurs in the middle age of the The Samoyed dogs which is caused by the inflammation of the pancreas.Samoyed Dogs sweat glands are between their paw pads. It is a Fact a Samoyed Dog sees in color and have better low light vision. Samoyed Dogs have three eyelids, a lower lid, an upper eyelid lid and a third lid, that is called a haw or nictitating membrane, this keeps the dogs eye protected and moist. Samoyed Dogs eyes have a special membrane for seeing better at night, called a tapetum lucidum - a dogs reflective layer in the choroid chiefly of nocturnal, causing the eyes to glow when light at night hits the eyes and they consist of some layers of smooth flat cells covered by a section of double deformed crystals. All dogs are identical in makeup big or small– 42 permanent teeth and 321 bones. Samoyed Puppies have 28 teeth and when they become adult Samoyed Dogs they have 42 teeth. When Samoyed puppies are born, they have no teeth and are deaf and blind. Samoyed Puppies for their first few weeks will sleep ninety percent of the day and their vision is not fully developed until after the first month. If purchasing a Samoyed dog from a breeder, make sure to find a good breeder with references check at least two to three of the puppies that were purchased from this breeder. The Samoyed dog belongs to the Working Group and in 1906 it was recognized by the (AKC) American Kennel Club. A Samoyed Dog’s mouth can apply approximately 150 to 200 pounds of pressure per square inch and an American Pit Bull Terrier, German Shepherd Dog and a rottweiler can have 320 LBS of pressure on avg.